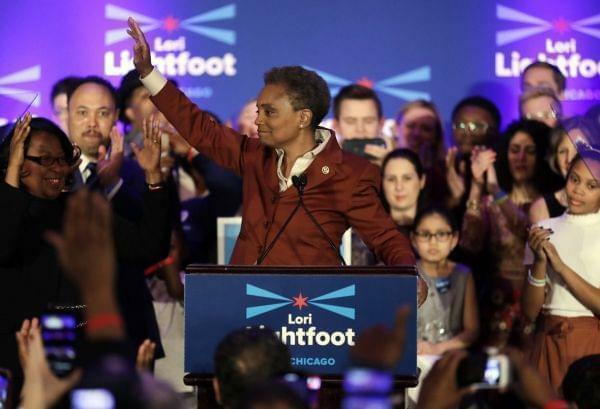 Lori Lightfoot waves to supporters as she speaks at her election night party Tuesday, April 2, 2019, in Chicago. Lori Lightfoot elected Chicago mayor, making her the first African-American woman to lead the city. Lightfoot won a resounding victory in Chicago’s mayoral election, defeating Cook County Board President Toni Preckwinkle with 74 percent of the vote. Whether the win went to Lightfoot or Preckwinkle, it would be a historic one, as either candidate would be the first black woman elected to the office. Lightfoot will also become Chicago’s first openly gay mayor. Jen Sabella is the co-founder of Block Club Chicago, and she just got done with the election night frenzy. She joins us now to talk about the results and the next steps for mayor-elect Lightfoot. We're also joined by Tom Holbrook, a professor at the University of Wisconsin-Milwaukee’s department of political science. He’s researched voter turnout in local elections. In recent weeks we’ve seen major flooding in large parts of the Midwest. Multiple states, including Iowa and Wisconsin, declared emergencies, and in total three deaths were associated with the flooding so far. Towns in northern and western Illinois were hit hard as well. When natural disasters like these happen, they test the systems put in place by local, state, and federal authorities to prevent the loss of life or property. In 2011, we also had major floods here in Illinois. Along the Mississippi River, six other states were flooded, including Missouri. In southern Illinois, the Army Corps of Engineers had a plan to prevent flooding in the town of Cairo, which gets its name from Cairo Egypt because the banks of the Mississippi River would overflow and make crops more fertile, just like the Nile. But that plan to save Cairo was delayed by public pressure from officials in Missouri. The arguments were over which lands were really worth saving, the Illinois town that was flooding, or the Missouri farmland across the river. That delay cost millions of dollars in damage to southern Illinois. Lisa Song and Patrick Michaels have looked back and into this. Lisa is an environment reporter with ProPublica. Patrick Michaels is a reporter with Reveal at the Center for Investigative Reporting. They both spoke with Niala Boodhoo last fall. We're revisiting our conversation with @PatrickMichels of @reveal & @LisaLSong of @ProPublica join us for today's show. An exhibit tracing President John F. Kennedy’s life from his boyhood to his presidency opened this past February at the Abraham Lincoln Presidential Library and Museum. Called “American Visionary,” it not only features iconic images from JFK’s life, and some rarely seen before, but it puts the President of Camelot in context with our state’s own great president, Abraham Lincoln. The exhibit is running until May 15. Chris Wills is Director of Communications and Public Affairs from the Lincoln Presidential Library and Museum. And Lawrence Schiller is the director, photographer, and writer who curated this exhibit. They both spoke with Niala Boodhoo back in February when the exhibit first opened. There's an exhibition at the @ALPLM on #JFK called "American Visionary." It opened in Feb and will be open until mid-May.